Quiet, Peaceful, Private. VINEYARD, RIVERFRONT! A bountiful Compound, Las Parras de Abiquiu, with a beautiful home, 2 guest houses, often rented by travelers, and a maturing vineyard of 6000+ vines awaits you, where the earth is grounding, the air is clean, and the skies and mesas speak with the beauty of the colors that change throughout the day and the seasons. These 58+ acres of land surround the homes with the spectacular vineyard, lush gardens, fields of alfalfa, for farm animals, natural foliage, with plenty of space for horses and stables. Various colored cliffs, made famous by Georgia O'Keeffe, “Abiquiu Landscapes,” encircle the outer perimeter of this oasis. Thousands of acres of forest land are located near by. The southern boundary (1243 feet) meanders the middle of the Chama River. There is an abundance of shore line, use your imagination. Irrigation rights accompany the land, along with two domestic wells, one for the homes, the other for the vineyard and gardens. A well-established self-sustained, and well-maintained estate, can be enjoyed with much gratitude and satisfaction. 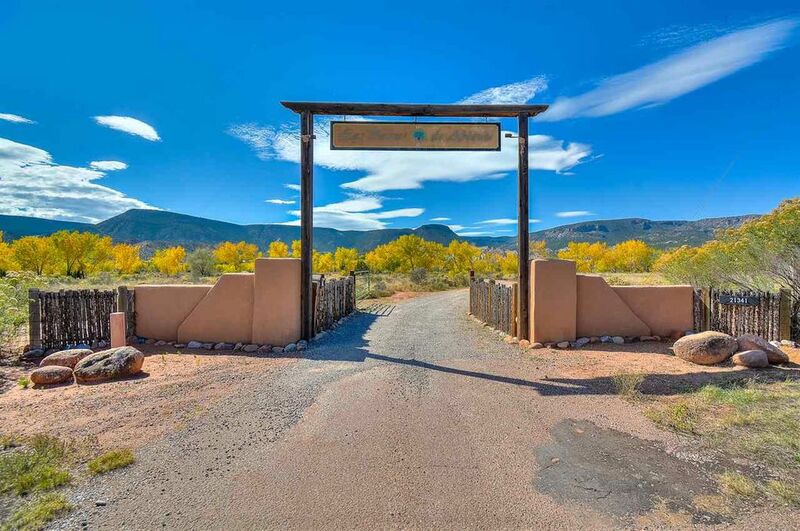 Abiquiu is rich in cultural traditions and becoming a destination for traveler and vacationer wanting quiet time and the opportunity to enjoy the wonderous landscapes surrounding the area. Santa Fe is less than an hour away. An excellent destination to enjoy the incredible museums, galleries, different cultural art markets, diverse cuisine, and the world-renowned Santa Fe Opera. Directions: From Santa Fe, take HWY 84/285 NORTH through Espanola. Continue on HWY 84 from Espanola to Abiquiu. The property is approximately 1.4 miles north of Bodes. Located on south side of highway.